Woo hoo — it’s time to link up your Spray Paint Projects!! This could be the biggest challenge yet!! We know there are absolutely FABULOUS Spray Paint projects out there! Come join the challenge and show the Krylon people YOUR Spray Painting skills! The wonderful Krylon people– will go through each project and find their personal #1 favorite, plus their top 10. 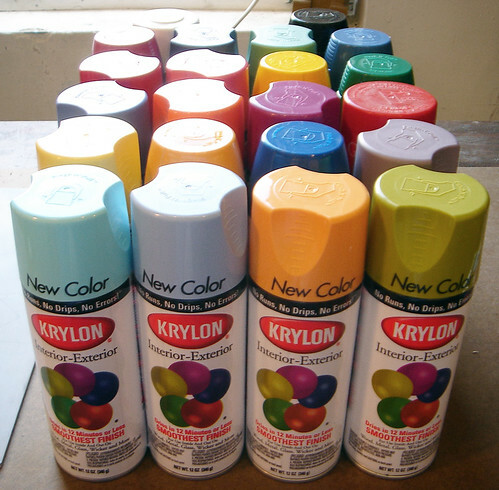 For this week, the winner of the customized 6-pack of Krylon spray paint will be Krylon’s #1 project pick. The challenge will be open until Thursday at noon (EST). Be sure and stop by Thursday for the introduction of next week’s theme and some inspiration to get you started. These challenges are so much fun! Each of you girls is such an inspiration–and together, look what you’ve created! On Tuesday I linked up a little platter I re-created with spray paint. Then I did another spray paint project this week, so I linked it, too! One of these days I need to get to some of the big projects that need tackling around here. For now, I’ll just be inspired by looking at other people’s work. Thank y’all for providing inspiration and motivation to get things done! It is so fun to see everyone’s projects! Thanks for your support – we love your blog! Krylon’s Ivy Leaf is my current favorite color! I would just love to win this challenge!! Wow, I am so excited! This is my first time entering and it couldn’t be a better challenge for me. I use Krylon all the time. It’s the very best! It’s fun to see what others have come up with. Talented people! I triple heart spray paint. Thanks for a fun party and a great giveaway. Thanks for hosting! This is the first time I have linked up to CSI! I love this blog! Such a great idea. So cute and clever. Last week, I spray painted a table for my covered patio, so I linked it up. I am looking forward to checking out other great projects. Thanks for hosting this week’s challenge. I LOVE spray paint! Love it! That prize package is fantastic! Can’t wait to check out the projects from this week! My first time to link up! I love the theme and look forward to checking out all the great projects! Gotta love spray paint!! I wonder how many cans I have gone through the last few years- too many to count for sure!! Thanks for the fun party! I am way excited about this contest! There are so many things that I could do and post using that set of spray paints!!! Thanks! Great prize! And I love these themed linky parties! Keep up the good work! Thanks for hosting! I’m so excited that I used Krylon’s ‘Celery’ when they are the judges! It’s such a great product. Excited to see what everyone’s come up with. I’m having trouble inserting the button into my post. Any wordpress.org users have advice?